The following guest article was written and submitted by Ted Sames. We welcome a variety of points of view on the subjects of shooting and marksmanship. Test them objectively on the range and let the results fall where they may. After conducting many SISS Home Defense and Personal Security Seminars with Threat Assessments, it became self-evident to the home owners that their dwellings offered little protection against various emergencies. These emergencies may include weather extremes, civil unrest and other types of organized criminal attack. The vast majority of home owners can not afford elaborate and expensive below ground bunkers systems as featured on the popular National Geographic’s Doomsday Bunkers and Preppers programs. Customers have inquired if there is a structure that is both affordable and could help fend off a criminal assault on their family. This structure should also double as a place where you could store gardening, boating and safety equipment or even a wet bar when not in its actual intended use. The structure would have to have a dual purpose and look attractive all at the same time. I have planned and tested an above ground structure called The BoomBox that would satisfy all these needs and requirements. The BoomBox is made with solid poured reinforced concrete on 3 sides and roof with a retaining wall directly behind the open side. The three sides and the retaining wall would have built-in portals to allow return defensive fire. The BoomBox is primarily designed to shelter 2 adults during riots associated with civil unrest. During testing, the prototype prevented penetration from small arms fire including shotgun, pistol, 223 REM and .308 WIN rifle projectiles. The BoomBox is designed for short term usage and for rapid and effortless entry and exit during time of dire emergencies hence, no doors are used except the retaining wall in the rear. 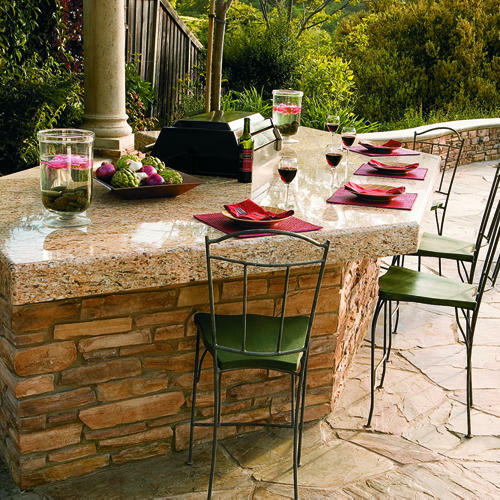 The retaining wall can also be used for seating during parties, Bar-B-Qs or get-togethers. The lay-out and size of The BoomBox may be modified for the needs of the customer. The exterior walls and roof may be designer finished and decorated with epoxy paint or beautiful tile work. Bullet proof armor plate may be used to cover the portals. The basic concrete 8’ x 4’ x 3.5’ structure will cost approximately $700 to $2000 depending on the options the customer desires.